Thomas O’Donald, who very soon will be Father Thomas O’Donald, has something in common with Peter, James, John and Andrew – fish. Peter & Co. fished for their living in the Sea of Galilee; Thomas fishes for the sheer fun of it in Rehoboth Bay. Now at age 27, he will follow their example by becoming a fisher of men and women through his ordination by Archbishop Charles Chaput at the Cathedral Basilica of SS. Peter and Paul on May 21. 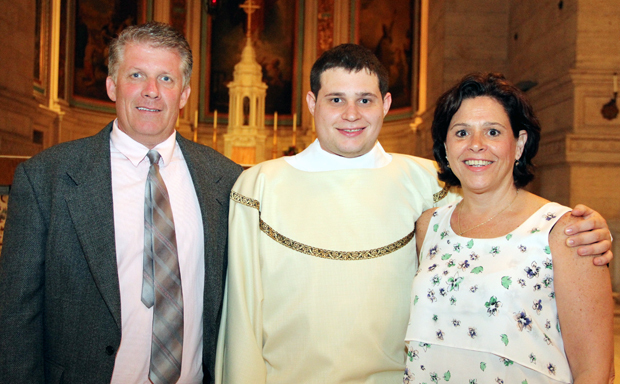 Thomas, who is the oldest of the three children of Thomas and Joanne O’Donald, was raised in St. Anastasia Parish, Newtown Square, and attended St. Aloysius Academy and Msgr. Bonner High School, the alma mater of his grandfather. While he was at Bonner he thought a bit about a religious vocation, especially when it was suggested to him by Augustinian Father Gus Esposito during his senior year. Father Esposito’s family and Thomas’ family are good friends through summer vacations at Rehoboth Beach. “Ever since I was born we spent the summer at the shore. I love anything on the water — fishing, crabbing, boating,” said Thomas, who also did a bit of lifeguarding. But even with the nudge from Father Esposito he just wasn’t ready to explore a religious vocation. Off he went to college at the Catholic University of America, with the intent of majoring in political science, probably a natural considering the university is located in Washington, D.C. While at Catholic U., he started attending Latin Masses, and really got caught up in the liturgy. “I began to see the Mass in a deep, spiritual way and to see the priest as a mediator between God and man,” he said. 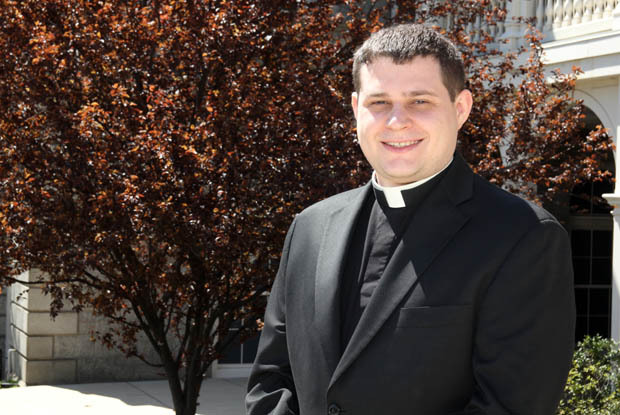 With the sense of a call to the priesthood deepening, he left Catholic University in the middle of his sophomore year and returned to Philadelphia, finishing out his year at St. Joseph’s University while applying to St. Charles Borromeo Seminary. He entered in 2009 with the full support of his family. Discernment of a priestly vocation was a continuing process rather than an instant conviction but “every year I felt more certain,” he said. “I really enjoyed the fellowship we had as seminarians and the fellowship the priests have,” he said. A pleasant surprise was one of the priests he would encounter at the seminary was his old mentor, Father Esposito, who is now director of apostolic formation at St. Charles. Not every man who enters the seminary stays to ordination; a number do discern that this is not what God is calling them to. Some of his classmates left. A real highlight of his seminary years was the visit of Pope Francis to St. Charles, something Thomas will never forget. 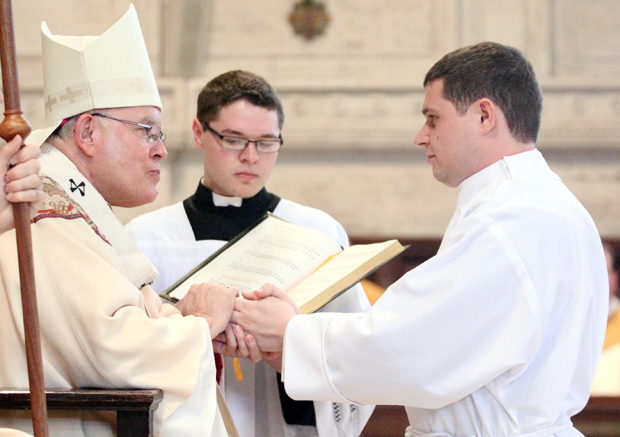 Among his most fulfilling experiences was over the past year as a transitional deacon serving in St. Philip Neri Parish in Lafayette Hill under the guidance of St. Philip’s pastor, Msgr. Charles Vance. With his ordination, Thomas will be relatively young, because most men enter at a later age in this generation. At this point he is really looking forward to it. But it’s a safe bet he’ll still find time to fish. 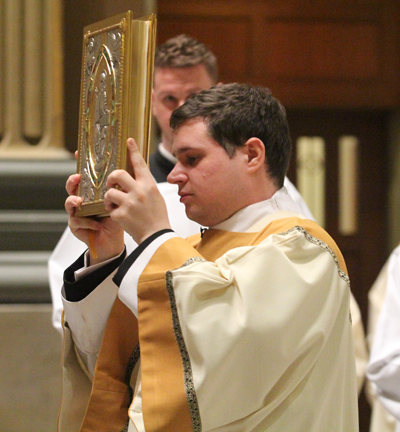 After ordination, Father Thomas O’Donald will celebrate his first Mass Sunday, May 22 at St. Anastasia Church, Newtown Square. Concelebrants will include Msgr. Charles Vance and Phillip Cribben, and Fathers Michael Colagreco, Martin Cioppi and Augustine Esposito, O.S.A., who will also be the homilist. Congratulations, Father Thomas O’Donald, on St. Rita’s Feast Day! !